The United States has 61 protected areas known as national parks that are operated by the National Park Service, an agency of the Department of the Interior. National parks must be established by an act of the United States Congress. A bill creating the first national park, Yellowstone, was signed into law by President Ulysses S. Grant in 1872, followed by Mackinac National Park in 1875 (decommissioned in 1895), and then Rock Creek Park (later merged into National Capital Parks), Sequoia and Yosemite in 1890. The Organic Act of 1916 created the National Park Service "to conserve the scenery and the natural and historic objects and wildlife therein, and to provide for the enjoyment of the same in such manner and by such means as will leave them unimpaired for the enjoyment of future generations." Many current national parks had been previously protected as national monuments by the president under the Antiquities Act before being upgraded by Congress. Seven national parks (including six in Alaska) are paired with a national preserve, areas with different levels of protection that are administered together but considered separate units and whose areas are not included in the figures below. Criteria for the selection of national parks include natural beauty, unique geological features, unusual ecosystems, and recreational opportunities (though these criteria are not always considered together). National monuments, on the other hand, are frequently chosen for their historical or archaeological significance. Fourteen national parks are designated UNESCO World Heritage Sites (WHS), while 21 national parks are designated UNESCO Biosphere Reserves (BR). Eight national parks are designated in both UNESCO programs. Twenty-nine states have national parks, as do the territories of American Samoa and the United States Virgin Islands. 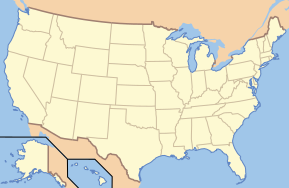 California has the most (nine), followed by Alaska (eight), Utah (five), and Colorado (four). The largest national park is Wrangell–St. Elias in Alaska: at over 8 million acres (32,375 km2), it is larger than each of the nine smallest states. The next three largest parks are also in Alaska. The smallest park is Gateway Arch National Park, Missouri, at approximately 192.83 acres (0.7804 km2). The total area protected by national parks is approximately 52.2 million acres (211,000 km2), for an average of 870 thousand acres (3,500 km2) but a median of only 229 thousand acres (930 km2). The national parks set a visitation record in 2017, with more than 84 million visitors. The most-visited national park is Great Smoky Mountains National Park in North Carolina and Tennessee, with over 11.3 million visitors in 2017, followed by Arizona's Grand Canyon National Park, with over 6.2 million. In contrast, only 11,177 people visited the remote Gates of the Arctic National Park and Preserve in Alaska in the same year. A few former national parks are no longer designated as such, or have been disbanded. Other units of the National Park Service (419 altogether) while broadly referred to as national parks within the National Park System do not hold the formal designation in their title. 44°21′N 68°13′W﻿ / ﻿44.35°N 68.21°W﻿ / 44.35; -68.21﻿ (Acadia) February 26, 1919 7008198600531111949♠49,075.26 acres (198.6 km2) 3,537,575 Covering most of Mount Desert Island and other coastal islands, Acadia features the tallest mountain on the Atlantic coast of the United States, granite peaks, ocean shoreline, woodlands, and lakes. There are freshwater, estuary, forest, and intertidal habitats. 14°15′S 170°41′W﻿ / ﻿14.25°S 170.68°W﻿ / -14.25; -170.68﻿ (National Park of American Samoa) October 31, 1988 7007334135580171374♠8,256.67 acres (33.4 km2) 28,626 The southernmost national park is on three Samoan islands and protects coral reefs, rainforests, volcanic mountains, and white beaches. The area is also home to flying foxes, brown boobies, sea turtles, and 900 species of fish. 38°41′N 109°34′W﻿ / ﻿38.68°N 109.57°W﻿ / 38.68; -109.57﻿ (Arches) November 12, 1971 7008310308822676081♠76,678.98 acres (310.3 km2) 1,663,557 This site features more than 2,000 natural sandstone arches, with some of the most popular arches in the park being Delicate Arch, Landscape Arch and Double Arch. Millions of years of erosion have created these structures located in a desert climate where the arid ground has life-sustaining biological soil crusts and potholes that serve as natural water-collecting basins. Other geologic formations include stone pinnacles, fins, and balancing rocks. 43°45′N 102°30′W﻿ / ﻿43.75°N 102.50°W﻿ / 43.75; -102.50﻿ (Badlands) November 10, 1978 7008982398434864749♠242,755.94 acres (982.4 km2) 1,008,942 The Badlands are a collection of buttes, pinnacles, spires, and mixed-grass prairies. The White River Badlands contain the largest assemblage of known late Eocene and Oligocene mammal fossils. The wildlife includes bison, bighorn sheep, black-footed ferrets, and prairie dogs. 25°39′N 80°05′W﻿ / ﻿25.65°N 80.08°W﻿ / 25.65; -80.08﻿ (Biscayne) June 28, 1980 7008699989247393156♠172,971.11 acres (700.0 km2) 469,253 Located in Biscayne Bay, this park at the north end of the Florida Keys has four interrelated marine ecosystems: mangrove forest, the Bay, the Keys, and coral reefs. Threatened animals include the West Indian manatee, American crocodile, various sea turtles, and peregrine falcon. 38°34′N 107°43′W﻿ / ﻿38.57°N 107.72°W﻿ / 38.57; -107.72﻿ (Black Canyon of the Gunnison) October 21, 1999 7008124565316292353♠30,780.76 acres (124.6 km2) 308,962 The park protects a quarter of the Gunnison River, which slices sheer canyon walls from dark Precambrian-era rock. The canyon features some of the steepest cliffs and oldest rock in North America, and is a popular site for river rafting and rock climbing. The deep, narrow canyon is composed of gneiss and schist which appears black when in shadow. 37°34′N 112°11′W﻿ / ﻿37.57°N 112.18°W﻿ / 37.57; -112.18﻿ (Bryce Canyon) February 25, 1928 7008145019423645217♠35,835.08 acres (145.0 km2) 2,679,478 Bryce Canyon is a geological amphitheater on the Paunsaugunt Plateau with hundreds of tall, multicolored sandstone hoodoos formed by erosion. The region was originally settled by Native Americans and later by Mormon pioneers. 38°12′N 109°56′W﻿ / ﻿38.2°N 109.93°W﻿ / 38.2; -109.93﻿ (Canyonlands) September 12, 1964 7009136620994652380♠337,597.83 acres (1,366.2 km2) 739,449 This landscape was eroded into a maze of canyons, buttes, and mesas by the combined efforts of the Colorado River, Green River, and their tributaries, which divide the park into three districts. The park also contains rock pinnacles and arches, as well as artifacts from Ancient Pueblo peoples. 38°12′N 111°10′W﻿ / ﻿38.20°N 111.17°W﻿ / 38.20; -111.17﻿ (Capitol Reef) December 18, 1971 7008978952779432460♠241,904.50 acres (979.0 km2) 1,227,627 The park's Waterpocket Fold is a 100-mile (160 km) monocline that exhibits the earth's diverse geologic layers. Other natural features include monoliths, cliffs, and sandstone domes shaped like the United States Capitol. 42°56′N 122°06′W﻿ / ﻿42.94°N 122.1°W﻿ / 42.94; -122.1﻿ (Crater Lake) May 22, 1902 7008741481423480638♠183,224.05 acres (741.5 km2) 720,659 Crater Lake lies in the caldera of an ancient volcano called Mount Mazama that collapsed 7,700 years ago. The lake is the deepest in the United States and is noted for its vivid blue color and water clarity. Wizard Island and the Phantom Ship are more recent volcanic formations within the caldera. As the lake has no inlets or outlets, the lake is replenished only by precipitation. 41°14′N 81°33′W﻿ / ﻿41.24°N 81.55°W﻿ / 41.24; -81.55﻿ (Cuyahoga Valley) October 11, 2000 7008131815623790160♠32,572.35 acres (131.8 km2) 2,096,053 This park along the Cuyahoga River has waterfalls, hills, trails, and exhibits on early rural living. The Ohio and Erie Canal Towpath Trail follows the Ohio and Erie Canal, where mules towed canal boats. The park has numerous historic homes, bridges, and structures, and also offers a scenic train ride. 67°47′N 153°18′W﻿ / ﻿67.78°N 153.30°W﻿ / 67.78; -153.30﻿ (Gates of the Arctic) December 2, 1980 7010304481327170114♠7,523,897.45 acres (30,448.1 km2) 9,591 The country's northernmost park protects an expanse of pure wilderness in Alaska's Brooks Range and has no park facilities. The land is home to Alaska Natives who have relied on the land and caribou for 11,000 years. 38°38′N 90°11′W﻿ / ﻿38.63°N 90.19°W﻿ / 38.63; -90.19﻿ (Gateway Arch) February 22, 2018 7005780355323931392♠192.83 acres (0.8 km2) 2,016,180 The Gateway Arch is a 630-foot (192 m) (both high and wide) catenary arch built to commemorate the Lewis and Clark Expedition, initiated by Thomas Jefferson, and the subsequent westward expansion of the country. The nearby Old Courthouse, across a greenway to the west of the arch, was the first site of the Dred Scott case about slavery. A museum, located in the underground visitor center below the arch, describes the arch's construction and the country's westward expansion. 38°59′N 114°18′W﻿ / ﻿38.98°N 114.30°W﻿ / 38.98; -114.30﻿ (Great Basin) October 27, 1986 7008312336378680832♠77,180.00 acres (312.3 km2) 153,094 Based around Nevada's second tallest mountain, Wheeler Peak, Great Basin National Park contains 5,000-year-old bristlecone pines, a rock glacier, and the limestone Lehman Caves. Due to its remote location, the park has some of the country's darkest night skies. Wildlife includes the Townsend's big-eared bat, pronghorn, and Bonneville cutthroat trout. 37°44′N 105°31′W﻿ / ﻿37.73°N 105.51°W﻿ / 37.73; -105.51﻿ (Great Sand Dunes) September 13, 2004 7008434397136001925♠107,341.87 acres (434.4 km2) 442,905 The tallest sand dunes in North America, up to 750 feet (230 m) tall, were formed by deposits of the ancient Rio Grande in the San Luis Valley. Abutting a variety of grasslands, shrublands, and wetlands, the park also has alpine lakes, six 13,000-foot mountains, and old-growth forests. 31°55′N 104°52′W﻿ / ﻿31.92°N 104.87°W﻿ / 31.92; -104.87﻿ (Guadalupe Mountains) October 15, 1966 7008349515253319063♠86,367.10 acres (349.5 km2) 172,347 This park contains Guadalupe Peak, the highest point in Texas, as well as the scenic McKittrick Canyon filled with bigtooth maples, a corner of the arid Chihuahuan Desert, and a fossilized coral reef from the Permian era. 34°31′N 93°03′W﻿ / ﻿34.51°N 93.05°W﻿ / 34.51; -93.05﻿ (Hot Springs) March 4, 1921 7007224519999000394♠5,548.01 acres (22.5 km2) 1,506,887 Hot Springs was established as a federal reserve by Congress on April 20, 1832—the oldest area managed by the National Park Service. Congress redesignated Hot Springs as a national park on March 4, 1921. Natural hot springs flow out of the Ouachita Mountains, providing opportunities for relaxation in a historic setting. Bathhouse Row preserves numerous examples of 19th-century architecture. Hot Springs is the first national park in a city and was the smallest national park until February 22, 2018 when the Jefferson National Expansion Memorial was redesignated Gateway Arch National Park. 41°39′12″N 87°03′09″W﻿ / ﻿41.6533°N 87.0524°W﻿ / 41.6533; -87.0524﻿ (Indiana Dunes) February 15, 2019 7007609739857163008♠15,067 acres (61.0 km2) 1,756,079 Previously designated a national lakeshore, the dunes run for nearly 25 miles (40 km) along the southern shore of Lake Michigan. The sandy beach adjoins a grassy prairie, bog, and wetlands home to over 2,000 species. 58°30′N 155°00′W﻿ / ﻿58.50°N 155.00°W﻿ / 58.50; -155.00﻿ (Katmai) December 2, 1980 7010148702926184076♠3,674,529.33 acres (14,870.3 km2) 37,818 This park on the Alaska Peninsula protects the Valley of Ten Thousand Smokes, an ash flow formed by the 1912 eruption of Novarupta, as well as Mount Katmai. Over 2,000 grizzly bears come here each year to catch spawning salmon. Other wildlife includes caribou, wolves, moose, and wolverines. 59°55′N 149°39′W﻿ / ﻿59.92°N 149.65°W﻿ / 59.92; -149.65﻿ (Kenai Fjords) December 2, 1980 7009270997760560298♠669,650.05 acres (2,710.0 km2) 321,596 Near Seward on the Kenai Peninsula, this park protects the Harding Icefield and at least 38 glaciers and fjords stemming from it. The only area accessible to the public by road is Exit Glacier; the rest must be viewed or reached from boat tours. 67°33′N 159°17′W﻿ / ﻿67.55°N 159.28°W﻿ / 67.55; -159.28﻿ (Kobuk Valley) December 2, 1980 7009708489693589546♠1,750,716.16 acres (7,084.9 km2) 14,937 Kobuk Valley protects 61 miles (98 km) of the Kobuk River and three regions of sand dunes. Created by glaciers, the Great Kobuk, Little Kobuk, and Hunt River Sand Dunes can reach 100 feet (30 m) high and 100 °F (38 °C), and they are the largest dunes in the Arctic. Twice a year, half a million caribou migrate through the dunes and across river bluffs that expose well-preserved ice age fossils. 60°58′N 153°25′W﻿ / ﻿60.97°N 153.42°W﻿ / 60.97; -153.42﻿ (Lake Clark) December 2, 1980 7010106020211880659♠2,619,816.49 acres (10,602.0 km2) 14,479 The region around Lake Clark features four active volcanoes, including Mount Redoubt, as well as an abundance of rivers, glaciers, and waterfalls. Temperate rainforests, a tundra plateau, and three mountain ranges complete the landscape. 40°29′N 121°31′W﻿ / ﻿40.49°N 121.51°W﻿ / 40.49; -121.51﻿ (Lassen Volcanic) August 9, 1916 7008431350460144322♠106,589.02 acres (431.4 km2) 499,435 Lassen Peak, the largest lava dome volcano in the world, is joined by all three other types of volcanoes in this park: shield, cinder cone, and composite. Though Lassen itself last erupted in 1915, most of the rest of the park is continuously active. Numerous hydrothermal features, including fumaroles, boiling pools, and bubbling mud pots, are heated by molten rock from beneath the peak. 46°51′N 121°45′W﻿ / ﻿46.85°N 121.75°W﻿ / 46.85; -121.75﻿ (Mount Rainier) March 2, 1899 7008956602557971444♠236,381.64 acres (956.6 km2) 1,518,491 Mount Rainier, an active stratovolcano, is the most prominent peak in the Cascades and is covered by 26 named glaciers including Carbon Glacier and Emmons Glacier, the largest in the contiguous United States. The mountain is popular for climbing, and more than half of the park is covered by subalpine and alpine forests and meadows seasonally in bloom with wildflowers. Paradise on the south slope is the snowiest place on Earth where snowfall is measured regularly. The Longmire visitor center is the start of the Wonderland Trail, which encircles the mountain. 48°42′N 121°12′W﻿ / ﻿48.70°N 121.20°W﻿ / 48.70; -121.20﻿ (North Cascades) October 2, 1968 7009204277598894410♠504,780.94 acres (2,042.8 km2) 30,085 This complex includes two geographically distinct units of the national park, as well as Ross Lake and Lake Chelan National Recreation Areas. The highly glaciated mountains are spectacular examples of Cascade geology. Popular hiking and climbing areas include Cascade Pass, Mount Shuksan, Mount Triumph, and Eldorado Peak. 35°04′N 109°47′W﻿ / ﻿35.07°N 109.78°W﻿ / 35.07; -109.78﻿ (Petrified Forest) December 9, 1962 7008895934393194984♠221,390.21 acres (895.9 km2) 644,922 This portion of the Chinle Formation has a large concentration of 225-million-year-old petrified wood. The surrounding Painted Desert features eroded cliffs of red-hued volcanic rock called bentonite. Dinosaur fossils and over 350 Native American sites are also protected in this park. 36°29′N 121°10′W﻿ / ﻿36.48°N 121.16°W﻿ / 36.48; -121.16﻿ (Pinnacles) January 10, 2013 7008107993317836932♠26,685.73 acres (108.0 km2) 222,152 Named for the eroded leftovers of a portion of an extinct volcano, the park's massive black and gold monoliths of andesite and rhyolite are a popular destination for rock climbers. Hikers have access to trails crossing the Coast Range wilderness. The park is home to the endangered California condor (Gymnogyps californianus) and one of the few locations in the world where these extremely rare birds can be seen in the wild. Pinnacles also supports a dense population of prairie falcons, and more than 13 species of bat which populate its talus caves. 32°15′N 110°30′W﻿ / ﻿32.25°N 110.50°W﻿ / 32.25; -110.50﻿ (Saguaro) October 14, 1994 7008371160350517040♠91,715.72 acres (371.2 km2) 957,405 Split into the separate Rincon Mountain and Tucson Mountain districts, this park is evidence that the dry Sonoran Desert is still home to a great variety of life spanning six biotic communities. Beyond the namesake giant saguaro cacti, there are barrel cacti, chollas, and prickly pears, as well as lesser long-nosed bats, spotted owls, and javelinas. 38°32′N 78°21′W﻿ / ﻿38.53°N 78.35°W﻿ / 38.53; -78.35﻿ (Shenandoah) December 26, 1935 7008806205711980706♠199,217.77 acres (806.2 km2) 1,264,880 Shenandoah's Blue Ridge Mountains are covered by hardwood forests that teem with a wide variety of wildlife. The Skyline Drive and Appalachian Trail run the entire length of this narrow park, along with more than 500 miles (800 km) of hiking trails passing scenic overlooks and cataracts of the Shenandoah River. 46°58′N 103°27′W﻿ / ﻿46.97°N 103.45°W﻿ / 46.97; -103.45﻿ (Theodore Roosevelt) November 10, 1978 7008285088449234606♠70,446.89 acres (285.1 km2) 749,389 This region that enticed and influenced President Theodore Roosevelt consists of a park of three units in the northern badlands. Besides Roosevelt's historic cabin, there are numerous scenic drives and backcountry hiking opportunities. Wildlife includes American bison, pronghorn, bighorn sheep, and wild horses. 18°20′N 64°44′W﻿ / ﻿18.33°N 64.73°W﻿ / 18.33; -64.73﻿ (Virgin Islands) August 2, 1956 7007604600349506560♠14,940.00 acres (60.5 km2) 112,287 This island park on Saint John preserves Taíno archaeological sites and the ruins of sugar plantations from Columbus's time, as well as all the natural environs. Surrounding the pristine beaches are mangrove forests, seagrass beds, and coral reefs. 48°30′N 92°53′W﻿ / ﻿48.50°N 92.88°W﻿ / 48.50; -92.88﻿ (Voyageurs) January 8, 1971 7008883024678396143♠218,200.15 acres (883.0 km2) 239,656 This park protecting four lakes near the Canada–US border is a site for canoeing, kayaking, and fishing. The park also preserves a history populated by Ojibwe Native Americans, French fur traders called voyageurs, and gold miners. Formed by glaciers, the region features tall bluffs, rock gardens, islands, bays, and several historic buildings. 43°34′N 103°29′W﻿ / ﻿43.57°N 103.48°W﻿ / 43.57; -103.48﻿ (Wind Cave) January 9, 1903 7008137475112028322♠33,970.84 acres (137.5 km2) 656,397 Wind Cave is distinctive for its calcite fin formations called boxwork, a unique formation rarely found elsewhere, and needle-like growths called frostwork. The cave is one of the longest and most complex caves in the world. Above ground is a mixed-grass prairie with animals such as bison, black-footed ferrets, and prairie dogs, and ponderosa pine forests that are home to cougars and elk. The cave is culturally significant to the Lakota people as the site "from which Wakan Tanka, the Great Mystery, sent the buffalo out into their hunting grounds." 37°18′N 113°03′W﻿ / ﻿37.30°N 113.05°W﻿ / 37.30; -113.05﻿ (Zion) November 19, 1919 7008595847080002037♠147,237.02 acres (595.8 km2) 4,320,033 Located at the junction of the Colorado Plateau, Great Basin, and Mojave Desert, this park contains sandstone features such as mesas, rock towers, and canyons, including the Virgin River Narrows. The various sandstone formations and the forks of the Virgin River create a wilderness divided into four ecosystems: desert, riparian, woodland, and coniferous forest. ^ "NPS Organic Act Overview". nature.nps.gov. National Park Service. 17 January 2007. Archived from the original on 6 February 2017. Retrieved 26 February 2017. ^ "World Heritage List - United States of America". whc.unesco.org. UNESCO World Heritage Centre. Archived from the original on 25 February 2017. Retrieved 25 February 2017. ^ a b "UNESCO » Biosphere Reserves » United States of America". unesco.org. UNESCO. November 2015. Archived from the original on 22 February 2017. Retrieved 22 February 2017. ^ a b The National Parks: Index 2012–2016 (PDF). Washington, D.C.: National Park Service. Archived (PDF) from the original on 13 November 2018. Retrieved 19 November 2018. ^ "Annual Visitation by Park Type or Region for: 2017 By Park Type". Irma.NPS.gov. Retrieved 1 March 2018. ^ a b "Annual Park Ranking Report for Recreation Visitors in: 2017". irma.nps.gov. National Park Service. Retrieved 11 March 2019. ^ "Acadia National Park". National Park Service. Retrieved 23 March 2010. ^ "Acadia National Park Places To Go". National Park Service. Retrieved 28 January 2014. ^ "National Park of American Samoa". National Park Service. Retrieved 23 March 2010. ^ "Arches National Park - Arches Rock Stars". National Park Service. Retrieved 25 February 2017. ^ "Arches National Park". National Park Service. Retrieved 23 March 2010. ^ "Badlands National Park - Fossils". National Park Service. Retrieved 25 February 2017. ^ "Badlands National Park". National Park Service. Retrieved 23 March 2010. ^ "Big Bend National Park". National Park Service. December 8, 2009. ^ "Big Bend Biosphere Reserve and National Park". unesco.org. UNESCO. Archived from the original on 24 February 2017. Retrieved 24 February 2017. ^ "Biscayne National Park". National Park Service. Retrieved 23 March 2010. ^ "Black Canyon of the Gunnison National Park". National Park Service. Retrieved 23 March 2010. ^ "Bryce Canyon National Park". National Park Service. Retrieved 23 March 2010. ^ "Canyonlands National Park". National Park Service. Retrieved 23 March 2010. ^ "Capitol Reef National Park". National Park Service. Retrieved 23 March 2010. ^ "Carlsbad Caverns National Park". National Park Service. Retrieved 23 March 2010. 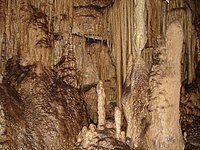 ^ "World Heritage List - Carlsbad Caverns National Park". unesco.org. UNESCO. Archived from the original on 24 February 2017. Retrieved 24 February 2017. ^ "Channel Islands National Park". National Park Service. Retrieved 23 March 2010. ^ "Channel Islands Biosphere Reserve". unesco.org. UNESCO. Archived from the original on 24 February 2017. Retrieved 24 February 2017. ^ "Congaree National Park". National Park Service. Retrieved 23 March 2010. ^ "South Atlantic Coastal Plain Biosphere Reserve". unesco.org. UNESCO. Archived from the original on 24 February 2017. Retrieved 24 February 2017. ^ "Crater Lake National Park". National Park Service. Retrieved 23 March 2010. ^ "Cuyahoga Valley National Park". National Park Service. Retrieved 23 March 2010. ^ "Cuyahoga Valley National Park Scenic Railroad". National Park Service. Retrieved 4 November 2012. ^ "Must See Highlights: Badwater Basin". National Park Service. Retrieved 4 March 2018. ^ "Death Valley National Park". National Park Service. Retrieved 23 March 2010. ^ a b "Mojave and Colorado Deserts Biosphere Reserve". unesco.org. UNESCO. Archived from the original on 24 February 2017. Retrieved 24 February 2017. ^ "Denali National Park". National Park Service. Retrieved 23 March 2010. ^ "Denali Biosphere Reserve and National Park". unesco.org. UNESCO. Archived from the original on 24 February 2017. Retrieved 24 February 2017. ^ "Dry Tortugas National Park". National Park Service. Retrieved 23 March 2010. ^ a b "Everglades & Dry Tortugas Biosphere Reserve". unesco.org. UNESCO. Archived from the original on 24 February 2017. Retrieved 24 February 2017. ^ "Everglades National Park". National Park Service. Retrieved 23 March 2010. ^ "World Heritage List - Everglades National Park". unesco.org. UNESCO. Archived from the original on 24 February 2017. Retrieved 24 February 2017. ^ "Gates of the Arctic National Park". National Park Service. Retrieved 23 March 2010. ^ "President Donald J. Trump Signs S. 1438 into Law". whitehouse.gov. The White House. February 22, 2018. Archived from the original on 22 February 2018. Retrieved 19 November 2018. ^ "Gateway Arch National Park". National Park Service. Retrieved 23 February 2018. ^ "Glacier National Park". National Park Service. Retrieved 23 March 2010. ^ "Glacier National Park - Fossils". National Park Service. Retrieved 25 February 2017. ^ "World Heritage List - Waterton Glacier International Peace Park". unesco.org. UNESCO. Archived from the original on 24 February 2017. Retrieved 24 February 2017. ^ "Glacier Biosphere Reserve and National Park". unesco.org. UNESCO. Archived from the original on 24 February 2017. Retrieved 24 February 2017. ^ "Glacier Bay National Park". National Park Service. Retrieved 23 March 2010. ^ a b "World Heritage List - Kluane / Wrangell-St. Elias / Glacier Bay / Tatshenshini-Alsek". unesco.org. UNESCO. Archived from the original on 24 February 2017. Retrieved 24 February 2017. ^ "Glacier Bay and Admiralty Island Biosphere Reserve". unesco.org. UNESCO. Archived from the original on 24 February 2017. Retrieved 24 February 2017. ^ "Grand Canyon National Park". National Park Service. Retrieved 23 March 2010. ^ "World Heritage List - Grand Canyon National Park". unesco.org. UNESCO. Archived from the original on 24 February 2017. Retrieved 24 February 2017. ^ "Grand Teton National Park". National Park Service. Retrieved 23 March 2010. ^ "Great Basin National Park". National Park Service. Retrieved 23 March 2010. ^ "Great Sand Dunes National Park". National Park Service. Retrieved 23 March 2010. ^ "Great Smoky Mountains National Park". National Park Service. Retrieved 23 March 2010. ^ "World Heritage List - Great Smoky Mountains National Park". unesco.org. UNESCO. Archived from the original on 24 February 2017. Retrieved 24 February 2017. ^ "Southern Appalachian Biosphere Reserve". unesco.org. UNESCO. Archived from the original on 24 February 2017. Retrieved 24 February 2017. ^ "Guadalupe Mountains National Park". National Park Service. Retrieved 23 March 2010. ^ "Haleakala National Park". National Park Service. Retrieved 23 March 2010. ^ a b "Hawaiian Islands Biosphere Reserve". unesco.org. UNESCO. Archived from the original on 24 February 2017. Retrieved 24 February 2017. ^ "Hawaii Volcanoes National Park". National Park Service. Retrieved 23 March 2010. ^ "World Heritage List - Hawaii Volcanoes National Park". unesco.org. UNESCO. Archived from the original on 24 February 2017. Retrieved 24 February 2017. ^ "Hot Springs National Park". National Park Service. Retrieved 23 March 2010. ^ "President Donald J. Trump Signs S. 1438 into Law". White House. ^ "Indiana Dunes National Park". National Park Service. Retrieved 16 February 2019. ^ "Isle Royale National Park". National Park Service. Retrieved 23 March 2010. ^ "Isle Royale Biosphere Reserve and National Park". unesco.org. UNESCO. Archived from the original on 24 February 2017. Retrieved 24 February 2017. ^ "Joshua Tree National Park". National Park Service. Retrieved 23 March 2010. ^ "Katmai National Park". National Park Service. Retrieved 23 March 2010. ^ "Kenai Fjords National Park". National Park Service. Retrieved 23 March 2010. ^ "Kings Canyon National Park". National Park Service. Retrieved 23 March 2010. ^ "Kings Canyon National Park". National Park Service. Retrieved 13 July 2018. ^ "Sequoia and Kings Canyon National Parks: Final General Management Plan and Comprehensive River Management Plan/Environmental Impact Statement". U.S. National Park Service. 2006. p. 35. Retrieved 13 July 2018. ^ Dilsaver, Lary M.; Tweed, William C. (1990). "Expansion of Sequoia and Creation of General Grant". Challenge of the Big Trees. U.S. National Park Service. Retrieved 13 July 2018. ^ a b "Sequoia and Kings Canyon Biosphere Reserve and National Parks". unesco.org. UNESCO. Archived from the original on 24 February 2017. Retrieved 24 February 2017. ^ "Kobuk Valley National Park". National Park Service. Retrieved 23 March 2010. ^ "Lake Clark National Park". National Park Service. Retrieved 23 March 2010. ^ "Lassen Volcanic National Park". National Park Service. Retrieved 23 March 2010. ^ "Mammoth Cave National Park". National Park Service. Retrieved 23 March 2010. ^ "World Heritage List - Mammoth Cave National Park". unesco.org. UNESCO. Archived from the original on 24 February 2017. Retrieved 24 February 2017. ^ "Mammoth Cave Area Biosphere Reserve and National Park". unesco.org. UNESCO. Archived from the original on 24 February 2017. Retrieved 24 February 2017. ^ "Mesa Verde National Park". National Park Service. Retrieved 23 March 2010. ^ "World Heritage List - Mesa Verde National Park". unesco.org. UNESCO. Archived from the original on 24 February 2017. Retrieved 24 February 2017. ^ "Mount Rainier National Park-Frequently Asked Questions". National Park Service. Retrieved 28 February 2017. ^ "Mount Rainier National Park". National Park Service. Retrieved 23 March 2010. ^ "North Cascades National Park". National Park Service. Retrieved 23 March 2010. ^ "Olympic National Park-Weather and Climate" (PDF). National Park Service. Retrieved 28 February 2017. ^ "Olympic National Park". National Park Service. Retrieved 23 March 2010. ^ "World Heritage List - Olympic National Park". unesco.org. UNESCO. Archived from the original on 24 February 2017. Retrieved 24 February 2017. ^ "Olympic Biosphere Reserve and National Park". unesco.org. UNESCO. Archived from the original on 24 February 2017. Retrieved 24 February 2017. ^ "Petrified Forest National Park". National Park Service. Retrieved 23 March 2010. ^ "Pinnacles National Park". National Park Service. January 11, 2013. Retrieved 2013-01-12. ^ "Redwood National Park". National Park Service. Retrieved 23 March 2010. 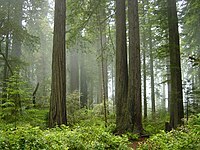 ^ "World Heritage List - Redwood National and State Parks". unesco.org. UNESCO. Archived from the original on 24 February 2017. Retrieved 24 February 2017. ^ "Rocky Mountain National Park". National Park Service. Retrieved 23 March 2010. 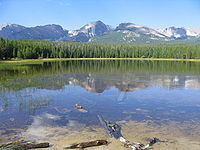 ^ "Rocky Mountain Biosphere Reserve and National Park". unesco.org. UNESCO. Archived from the original on 24 February 2017. Retrieved 24 February 2017. 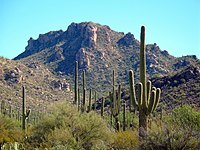 ^ "Saguaro National Park". National Park Service. Retrieved 23 March 2010. ^ "Sequoia National Park". National Park Service. Retrieved 23 March 2010. ^ "Shenandoah National Park". National Park Service. Retrieved 23 March 2010. ^ "Theodore Roosevelt National Park". National Park Service. Retrieved 23 March 2010. ^ "Virgin Islands National Park". National Park Service. Retrieved 23 March 2010. ^ "Voyageurs National Park". National Park Service. Retrieved 23 March 2010. ^ "Wind Cave National Park". National Park Service. Retrieved 23 March 2010. ^ "Wind Cave's Early Days". National Park Service. Retrieved 28 February 2017. ^ "Wrangell – St. Elias National Park". National Park Service. Retrieved 23 March 2010. ^ "Yellowstone National Park". National Park Service. Retrieved 23 March 2010. ^ "World Heritage List - Yellowstone National Park". unesco.org. UNESCO. Archived from the original on 24 February 2017. Retrieved 24 February 2017. ^ "Yellowstone Biosphere Reserve and National Park". unesco.org. UNESCO. Archived from the original on 24 February 2017. Retrieved 24 February 2017. ^ "Yosemite National Park". National Park Service. Retrieved 23 March 2010. ^ "World Heritage List - Yosemite National Park". unesco.org. UNESCO. Archived from the original on 24 February 2017. Retrieved 24 February 2017. 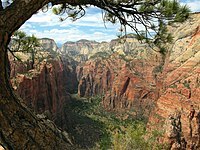 ^ "Zion National Park". National Park Service. Retrieved 23 March 2010. Wikimedia Commons has media related to National parks of the United States. This page was last edited on 9 April 2019, at 16:57 (UTC).